Peggy Carter, Focal Point of the MCU Lineage. The Marvel Cinematic Universe is rapidly expanding. Because of the ever growing roster of characters, it can be a little overwhelming at times. Sure, Captain America and Iron Man are easy enough, but how many casual fans recognize the names Harold Hogan, Darcy Lewis, Alexander Pierce, and Mike Peterson right away? Far fewer I’d guess. That is why it’s so interesting that given the huge stable of characters to choose from, Marvel has opted to make Peggy Carter such a linchpin. There has been a lot of talk recently about DC beating Marvel to the punch with the Wonder Woman movie set to release ahead of the Captain Marvel flick, signaling the first female lead superhero movie of the modern era. DC also claims a win on the small screen, with Marvel’s Jessica Jones premiering nearly a month after Supergirl popped up on CBS. But the truth is, Peggy Carter (Hayley Atwell), though neither bulletproof, nor in possession of extraordinary strength, is super in her own right. She is the quiet, mostly unheralded, architect of the MCU, and we love that. No, I’m not overstating it. Without Peggy, Steve Rogers never becomes Captain America, Tony Stark is never born, and there is no S.H.I.E.L.D. Without Peggy, WWII is likely lost to Hydra, Phil Coulson never grows up to idolize Cap, and the Avengers, at least as we know them, are never formed. Odds are by the time Banner becomes the Hulk, and Thor visits Earth, things are too far gone to turn around. Thank you Peggy. Agent Carter was trained as a spy during WWII, but went on to do so much more post war, proving to the doubters that she is so much more than just Captain America’s girlfriend. We’ve only seen glimpses of her post-Cap life so far, but we know that she saved Howard Stark’s life (making it possible for him to later father Tony) and helped to form S.H.I.E.L.D. 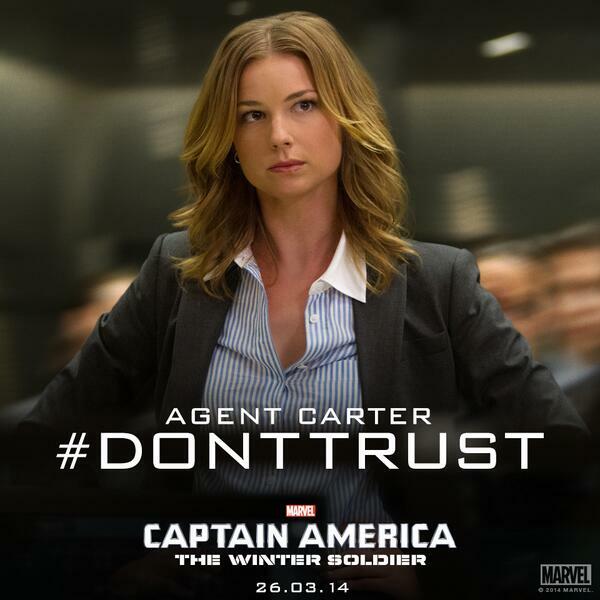 We know that she played a part in convincing Hank Pym to become Ant-Man, and we know that she is related to Sharon Carter (Emily VanCamp), whom played a pivotal role in Captain America: Winter Soldier. The exact relation hasn’t been made confirmed yet, but is likely to follow the comics, where Sharon is the great-niece of Peggy. Hence the line about talking to her aunt. It would seem however, that I’m not the only one with such an affinity for Agent Carter, the following video was posted to Facebook by UPROXX and echos many of the same points I did. So here we are, four episodes in the sophomore season of ABC’s Agent Carter, a show we weren’t sure was going to get a second year, and we’re soaking up everything we can. Lots of groundwork being laid here that will set up stories 60 years into the future of her timeline, and Peg doesn’t know just how important she already is. Kudos to Marvel, ABC, and showrunnners Tara Butters, Michele Fazekas, and Chris Dingess. For more on Agent Carter or the MCU in general, be sure to check back at Grizzly Bomb! You may have seen her when she first appeared in Up in the Air, or maybe when she was in Scott Pilgrim vs. the World. Oh, please tell me you didn’t see her in any of the Twilight films. If you did, that’s unfortunate, but at least you know about her then. Anna Kendrick is one of those actresses you definitely want to remember so fifty years from now you can say to your grandkids, “I remember some of her first performances.” Recently, Kendrick’s name has buzzed about the geek world not just because of her voice talents lent to ParaNorman, but also because she is up for the lead female role in Captain America: The Winter Soldier. Both Imogen Poots and Felicity Jones are also being considered for this position; one of them will most likely be playing Peggy Carter’s niece, Sharon Carter, though this character has only been rumored and not confirmed. [Ed. Note – both of whom have starred opposite of Anton Yelchin; Poots in Fright Night and Jones in Like Crazy] Now that all the female lead choices have been revealed, the blood bath has already begun. Heated arguments about which actress should get the lead have already popped up all over the internet, with most being in Kendrick’s favor. Brendon Connelly of Bleeding Cool says, “If we’re thinking of the casting in a ‘credible’ way, with both creative and commercial integrity, I think Kendrick probably has the edge on most counts: she’s cut-yourself sharp, well-known and well liked, and has great acting chops” [BleedingCool]. Cinemablend agrees with Connelly’s analysis of the female lead. Though both Poots and Jones are British and have the upper-hand in the accent realm, Cinemblend believes we should “never rule out Kendrick, who snagged an Oscar nomination for her first major role in Up in the Air, and seems tenacious enough to tackle a natural British accent in no time” [Cinemablend]. Yet don’t be too sure, state many film, comic book, and geek fans. Many believe Kendrick is not right for the role, right down to her looks. One person commented on Cinemblend’s report that “Imogen Poots looks and sounds like a great actress to play Peggy Carter’s niece in Cap 2. She looks more like Hayley Atwell than either Anna Kendrick or Felicity Jones, and she’s much better looking than Kendrick or Jones.” Some argue that looks are not everything, but others have pointed out that Kendrick is plainly too young for the niece of a woman from the 1940s. My thoughts? I have never seen Jones or Poots act before, but I have watched Kendrick, and I think she’s wonderful. Based solely on my previous impressions of her, I think she could pull off a British niece of Peggy Carter, but I do agree with those who have said she looks too young for the role. I would prefer to see a natural-born British woman who is slightly older steal the screen in The Winter Soldier, but I don’t want to make any judgement calls until I see Jones and Poots act, either in The Winter Soldier or otherwise. More news has come to light about the new Captain America movie. Well it’s here people. Fear Itself has arrived on comic book shelves. Did it wow me as much as my hype ridden brain was expecting? But it wasn’t supposed to I surmise. It wasn’t bad, just a whole lot of needed set up. It set the stage by showing us the main villains, the heroes and where the Asgardians stand at this point.